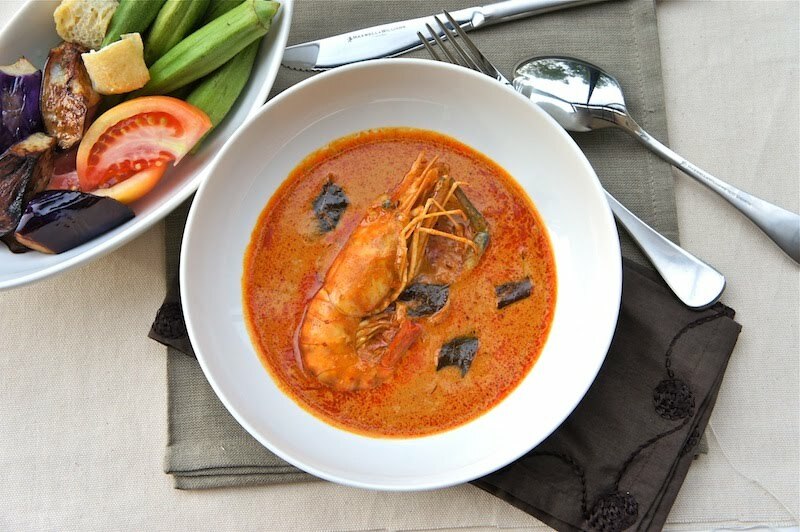 This Tamarind Curry Prawn is a great dish for the current cold wet weather here in Vancouver. I picked up some good sized frozen River Prawns from my grocer and decided to cook up this delicious curry dish for dinner. 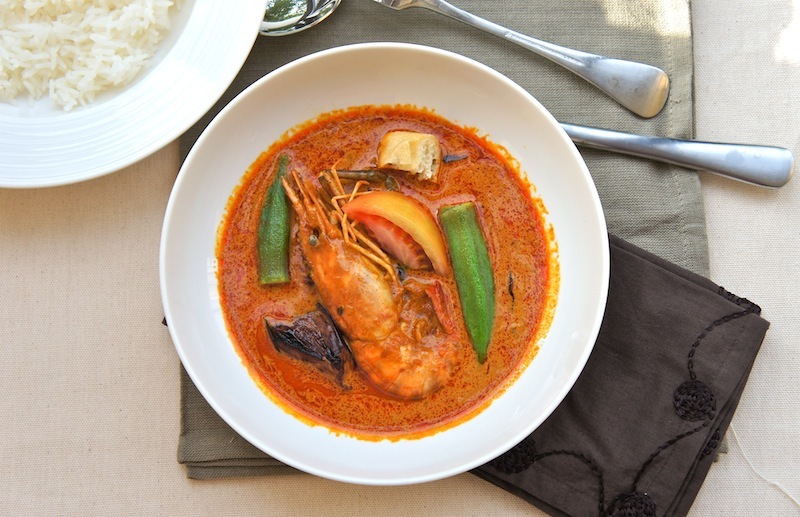 The prawns were sweet and it went so well with the slightly sour tamarind laced creamy coconut curry sauce. 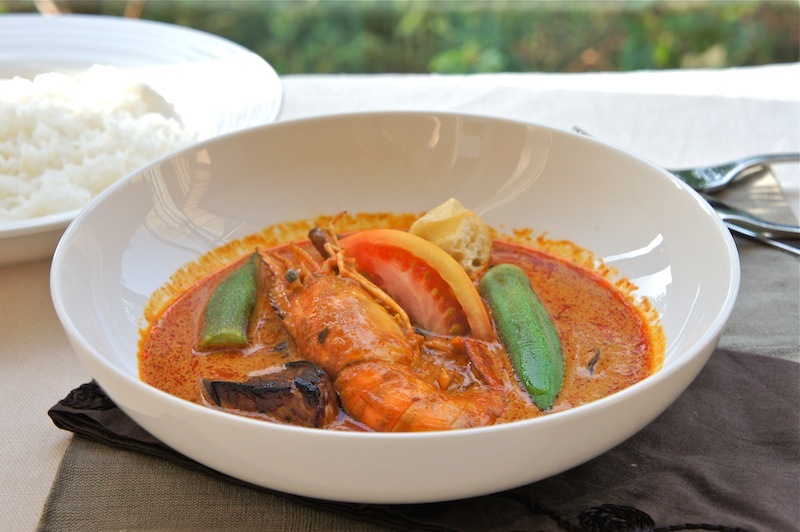 Like all curries, you will enjoy this dish with some steamed rice. Enjoy! Heat the oil in a heavy pot and set over medium high heat. When hot, put in the black mustard seeds. As soon as the mustard seeds begin to pop, add red onion, ginger, garlic, and curry leaves. Cook until the onions are light brown in color. Add the curry and chili powder. Cook until they are fragrant. Mix in the tamarind water and bring the mixture to a boil. Then add the coconut milk with 2 cups of water. Bring the curry sauce to a boil again. Cover, turn the heat to low and simmer for 25 minutes, stirring now and then. Then, add the prawns, eggplant, okra, tomatoes, chilies, and tofu puff. Turn the het on high and bring the mixture to a boil. Lower the heat and continue to cook further, for about 15 to 20 minutes or until the prawns and vegetables are fully cooked. Season the curry with sea salt. Serve the curry warm with steamed rice. this looks like pure heaven. I am so going to make this. Where do you find tamarinds here in Vancouver? I've only been able to find them at the South China Seas Trading Co. on Granville Island/Victoria Drive. Anywhere else? @Jaime (Sophistimom): Thanks and enjoy! @andrea: You can purchase tamarinds pulp in most Asian grocers. Try T&T stores. I don't think here i have seen this fish curry powder can i use someother curry powder??? Love the presentation. The dish looks delicious.